Thanks Cathy for the new addition of the Hughes Sofa for our den. When it arrived early this afternoon the delivery workers upon my request left it wrapped up in order to protect the sofa until we move. Of course I had to make a small slit in the wrapping to check the material. 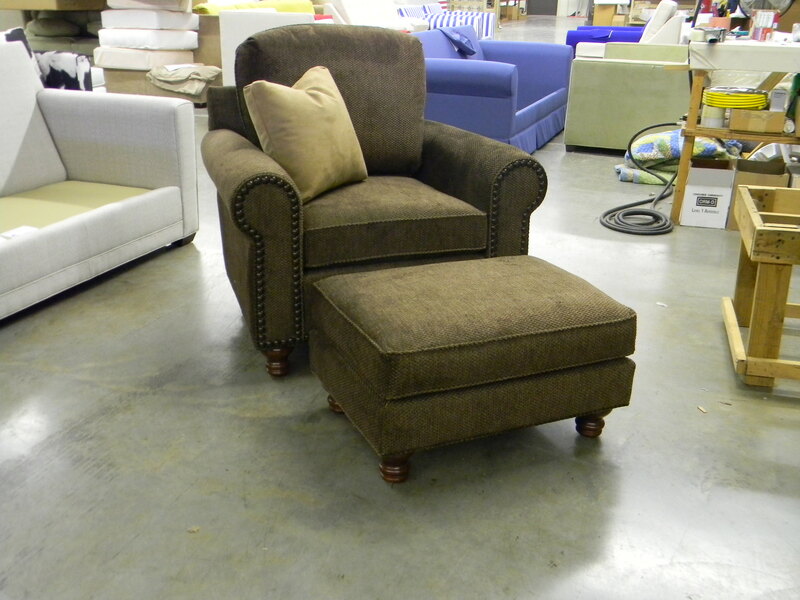 It is perfect and matches the chair and a half which was previously purchased from Carolina Chair. Thanks also for the nice gift for the sofa. There was never a chance it could be over looked! I appreciate your guidance and the quick delivery. Thanks for the best! 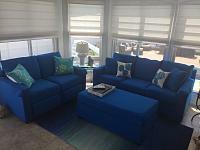 I wanted to send you a picture of the furniture in our sunroom. 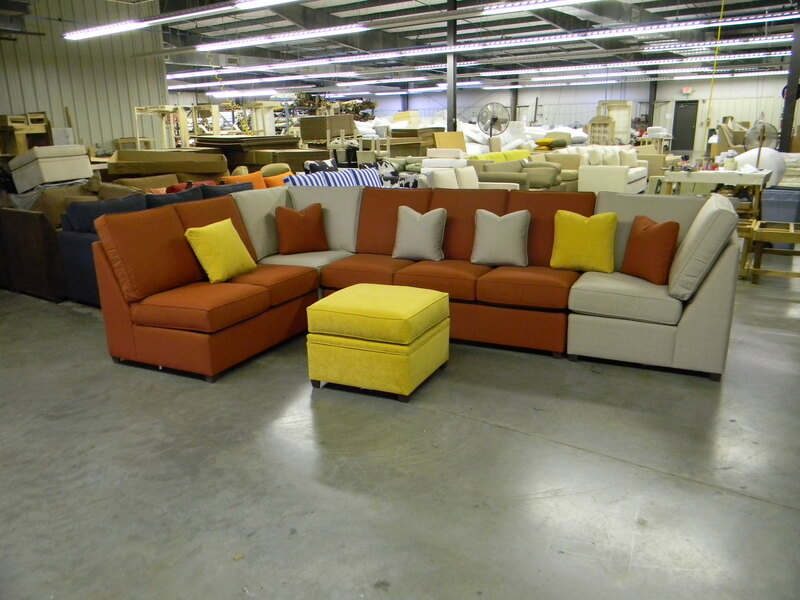 The fit & color are perfect for the space. 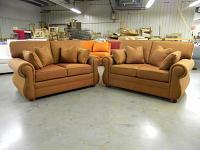 We wanted a sofa & love seat/recliners that was not only comfortable; but, good for us when wet after swimming. The Sunbrella fabric is perfect. 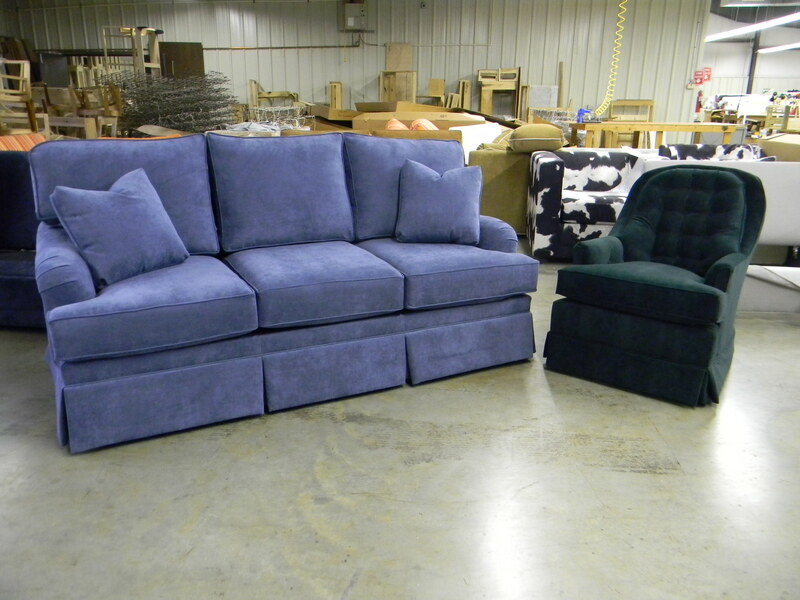 The ottoman doubles for storing the linens for the sofa bed. Greatly appreciate your recommendations for changes so that we could get a sofa & love seat in the area. Would highly recommend you company to family & friends. 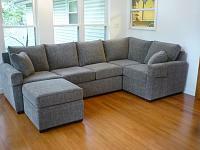 I've been meaning to let you know that our couch arrived on Sunday! Less than 8 weeks after I ordered it! I love it! It fits perfectly in the sun room corner I chose it for. I had a hard time getting my daughter out of it long enough to take some pictures. 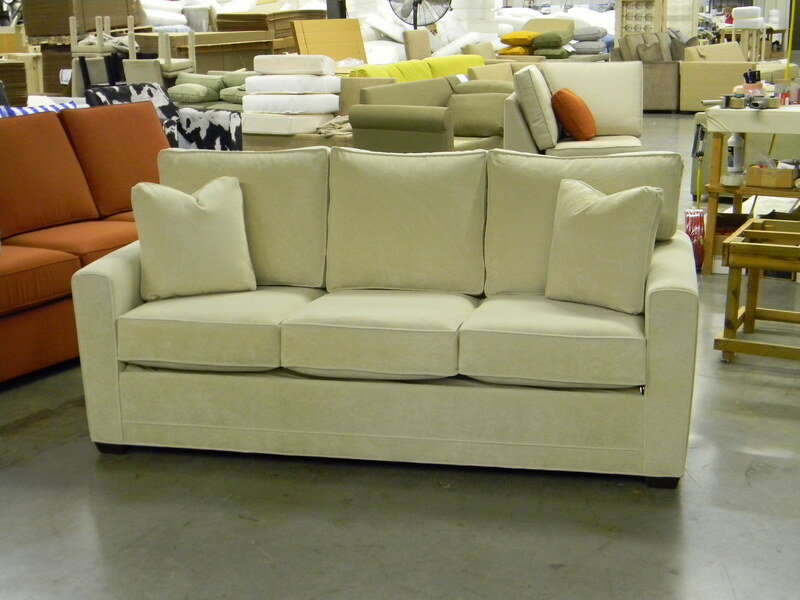 The custom modifications were ideal: The box cushions look crisp; the Henley arms are just the right touch. Also, tell your brother that he found the right fabric. I really appreciated the time you put into working with me via email and phone calls to put together what I wanted. I had a hard time choosing pictures. You are welcome to put any of them on your facebook page. Let me know if you decide to do that. If you want anything else let me know. Also, one of my friends has already said she intends to order from you too! I'm also saving for the basement furniture now. The sofa is safely in the room. It looks amazing! And it is so comfortable. I may never leave that room. 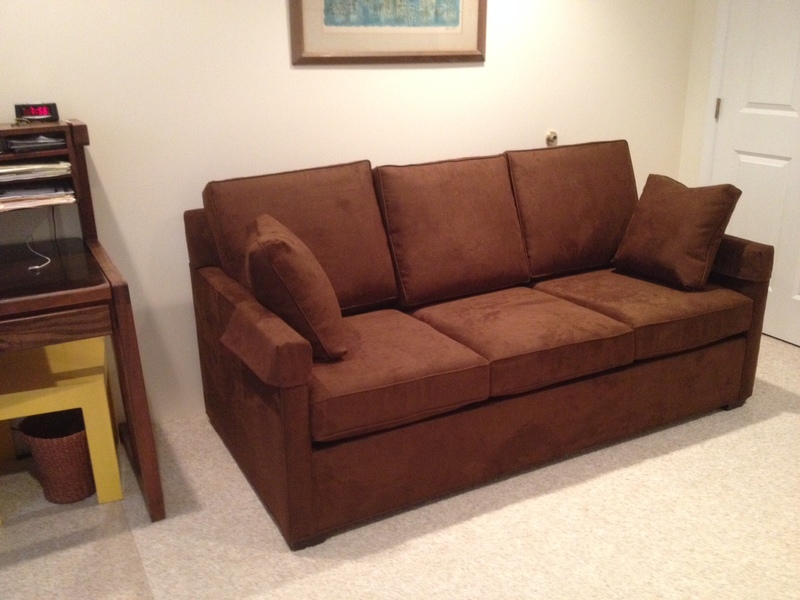 Attached is a picture of the sofa in my room. The sofa is much more exciting than the room. It is my 32 year old son's room turned into my knitting room (aka Woman Cave) so the beautiful sofa had to fit where there wasn't furniture. 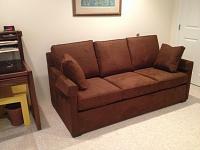 The sofa came today as promised, and I am thrilled. 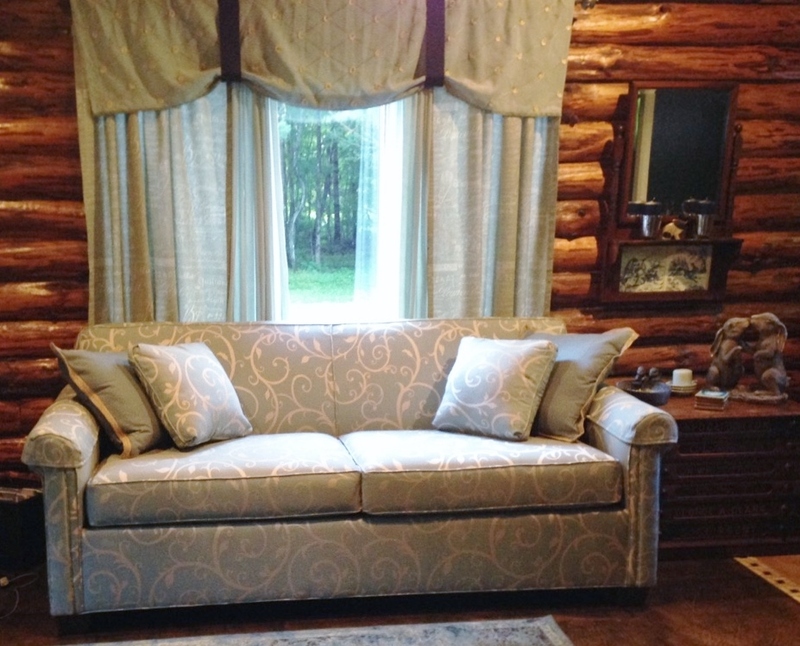 The fabric turned out well, and everything about the sofa and the bed is perfect. 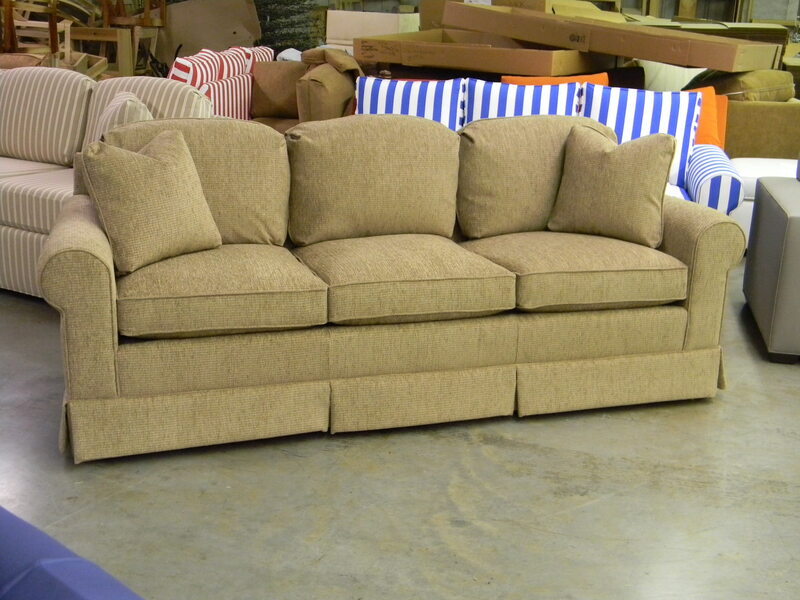 I particularly want to compliment the two gentlemen who delivered the sofa. 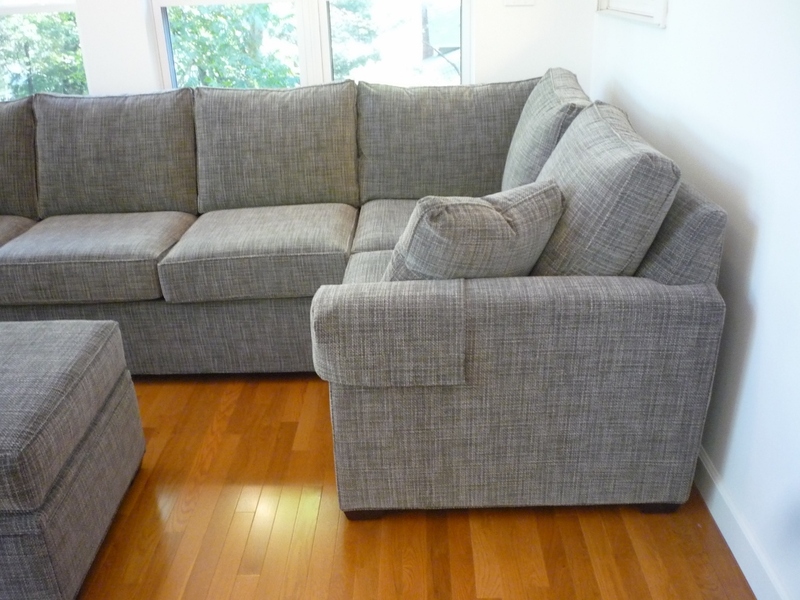 They were charming and competent and did a great job maneuvering the sofa through my tri-level house. Of course, I let them know how much I appreciated them, including a good tip. Hang onto those guys; they represent the company well. And thank you for all your personal and patient help with my order. 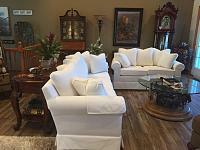 I will definitely recommend Carolina Chair to anyone who is looking for furniture. 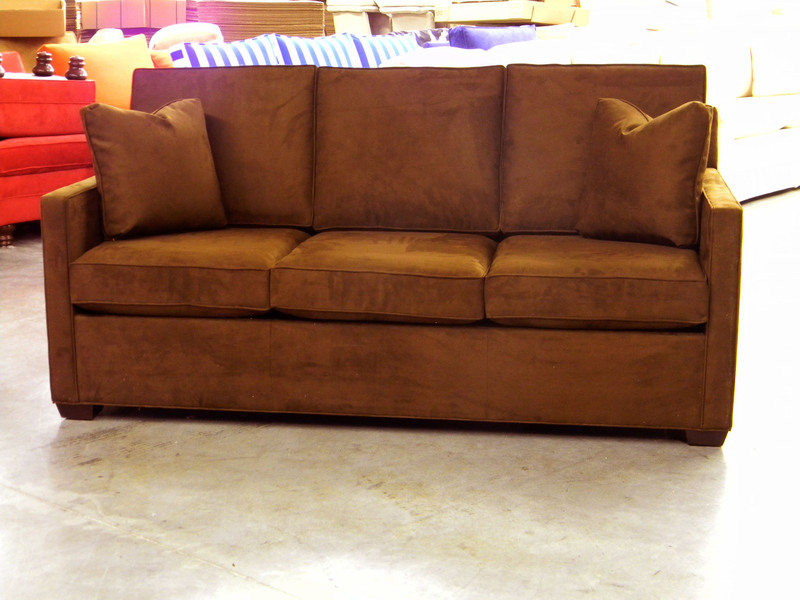 Our sleeper sofa arrived this morning and it is beautiful! It is extremely comfy and the fabric feels so plush. 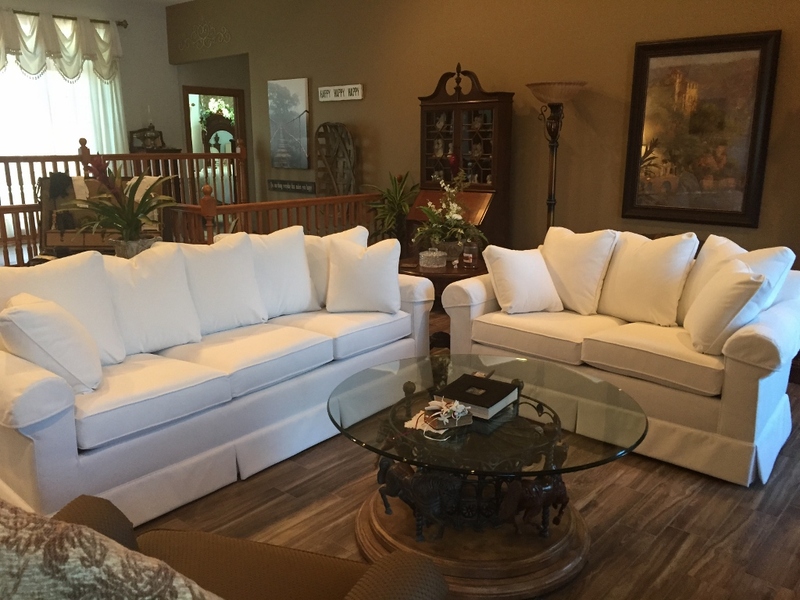 The fiber/down cushions are amazing and we are very impressed with the overall quality! Good morning, Cathy. How are you & family? We are really loving our couch! Thank you! Thanks, Cathy! 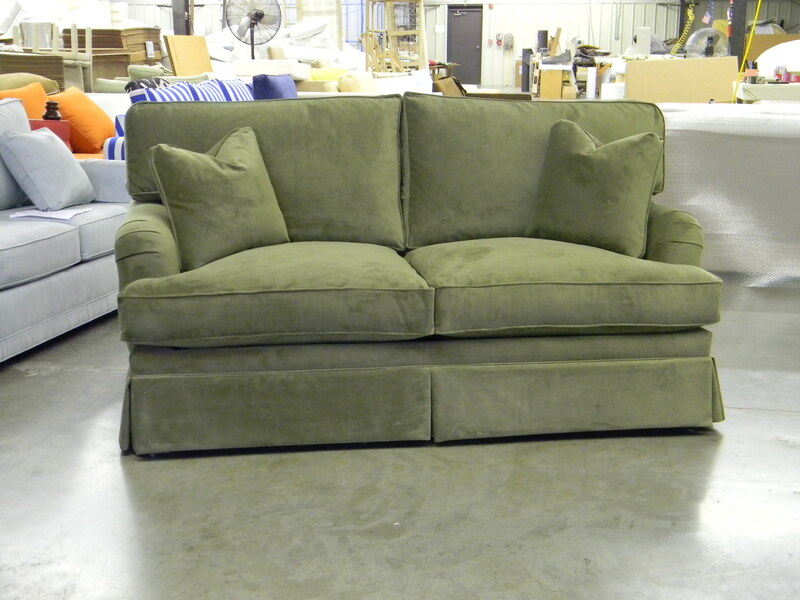 We love our new chaise -- it's so comfortable and looks great. 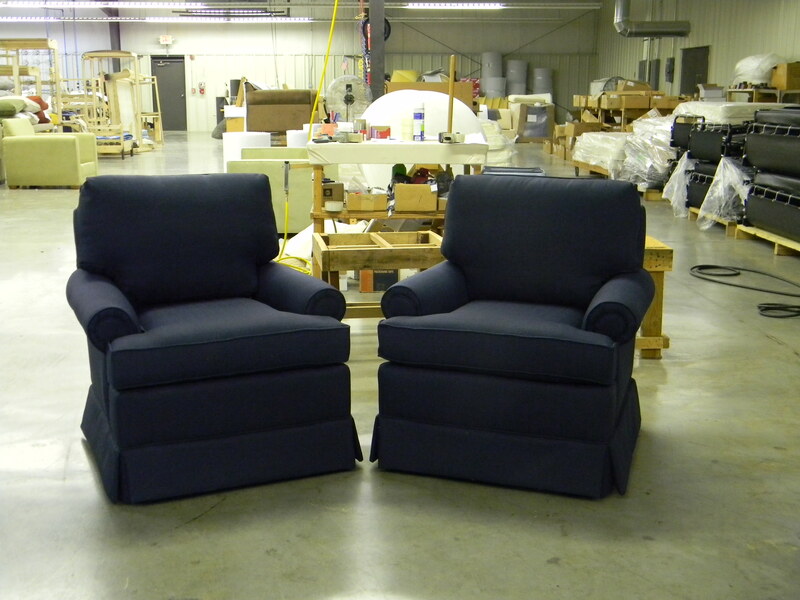 We are really pleased with our decision to purchase from Carolina Chair. Your company is so easy to work with from beginning the process (with tons of questions) through delivery. 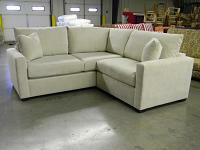 We will definitely recommend you to our friends and family for any furniture choices! Thanks for the top notch customer service. I received the valve and with the hair dryer tip replaced the valve in 5 minutes top. Thanks so much! We love the sofa and the delivery worked out just fine. Thanks again. Hi Cathy! 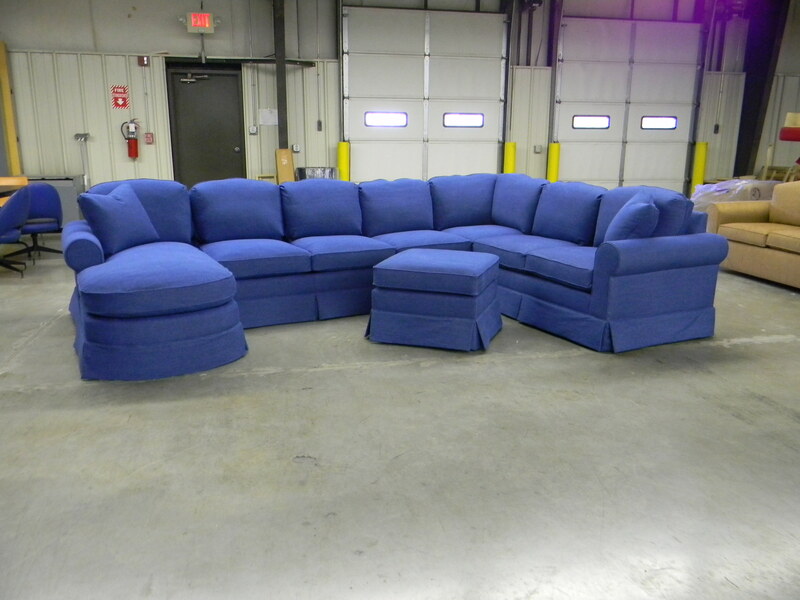 It has been 2.5 years, but just wanted to tell you that this is still the greatest sofa ever created in the history of the world. I'm the lawyer in Augusta and talked to you 10 million times and I can not imagine that you remember that, ha! Hi Cathy. 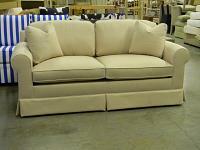 Dropping a note to let you know we received the sofa in perfect condition yesterday, one day earlier than anticipated. It is absolutely beautiful, quality construction throughout. Our initial trepidation about the color being too bright was put to rest once we got it into place. It adds just enough of a splash without being what i refer to as "south Florida obnoxious" We like the fact that in certain light it leans grey. Can't wait to lose the vertical blinds and replace with something more aestically pleasing. One step at a time I suppose. The couch arrived! All looks good. It's beautiful. Tony & Mike very professional and friendly...components connected nicely. Thanks so much for the awesome job! I will definitely recommend your company to anyone who is looking for custom made furniture. Looks great! Shipping guys were very nice. We haven't pulled out the sleeper mechanism yet, but will sometime soon. Great addition to our family room. Thank you. I just wanted to send along a photo of our chair from the warehouse and also in our house, and thank you again for the amazing work and for being so helpful with the whole ordering process. 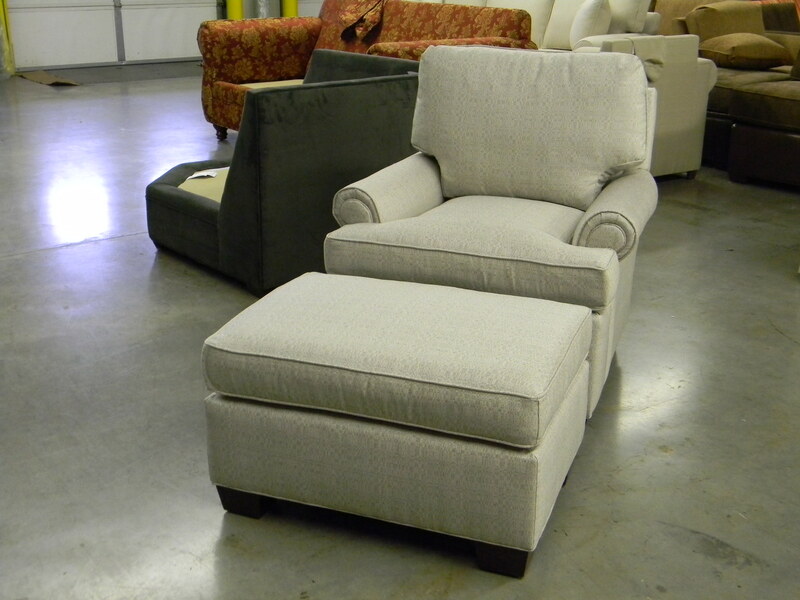 We got the Eliot chair and ottoman in Sunbrella's Linen Silver fabric, and we couldn't be happier with it. Guests always compliment how attractive and comfortable it is, and I often find my husband asleep on it after dinner, which for me is the best testament to its quality of all! 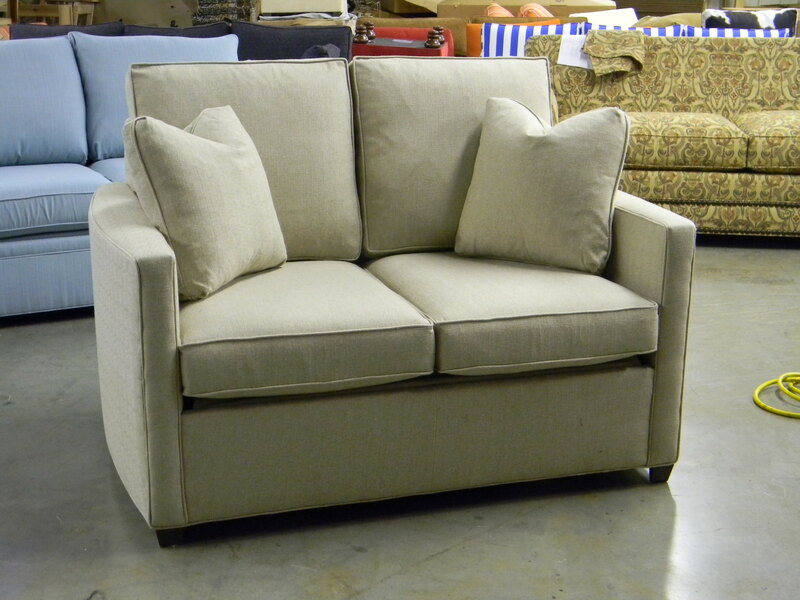 We'll certainly be making more Carolina Chair purchases in the future. 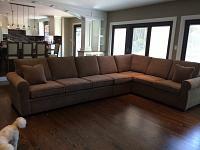 I received my sectional sofa last night. It’s perfect- so comfortable & exactly what I wanted. The delivery guys were great- very professional & careful. Thanks for the throw pillows too. It was so nice working with you- you made the process so easy. 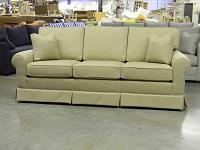 Our Crawford queen sleeper was delivered last night. Not only does it look great, but it nicely fits in the tight space between the end of the desk and gives enough space at the other end for the closet door to sufficiently open. Your suggesting that the arms could be reduced by a couple of inches was a great help. Your experience really shows, asking the right questions, resulting in a slight specification change from standard that makes quite a difference. The sofa arrived and looks great! Will send better pictures when the room is set up. Thanks so much! 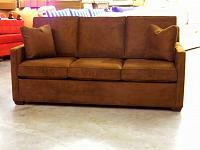 Our sofa arrived yesterday afternoon as promised. The delivery guys were very accommodating in dealing with a tight driveway and a tight entrance into the house. 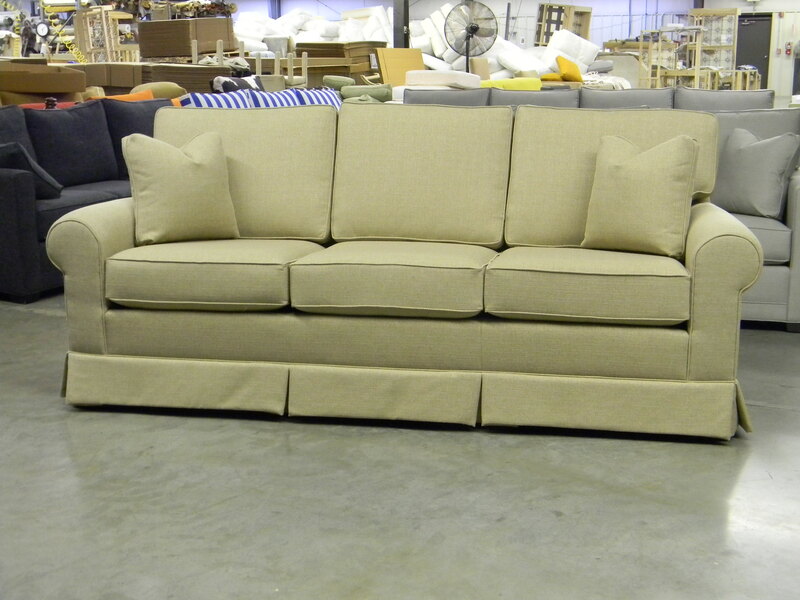 The craftsmanship of the sofa is outstanding, and I think the Crypton fabric we selected will last for many years. 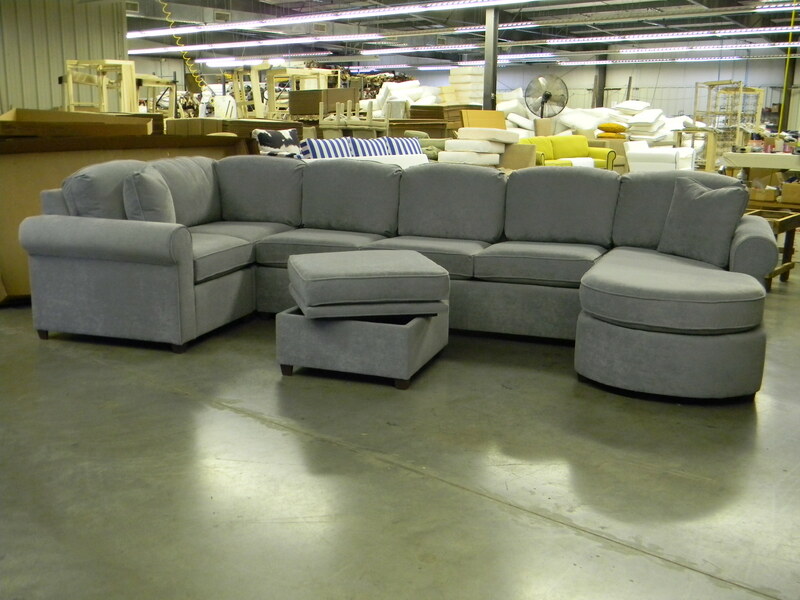 Our specialized sofa selection is ideal for those who prefer neatness, firmness, and support over being swallowed up into soft, easily wrinkled cushions. Thank you for making this an easy and enjoyable process. Sorry for the delay - hope you have been well! I had some unexpected gum surgery followed by an unpleasant experience with some antibiotics. Needless to say, I got behind! Anyway, the delivery service was great: the truck arrived around 8:30a on Sunday as they estimated they would. 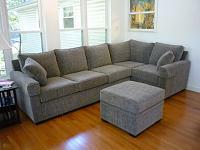 The two young guys were able to move our furniture in without issue and were courteous and fast. 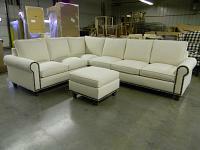 The furniture is comfortable and looks wonderful! My husband has declared that the armchair + ottoman is his favorite spot in the house. The cats love the furniture too and don't try to sharpen their claws on them the way they did with our old sofa. I would love to include photos of our pieces in place but our rooms are a work-in-progress right now and would not do The Henleys justice. Certainly not as nice as some of the more fabulous photos in your gallery! I mention CarolinaChair whenever an opportunity presents itself! 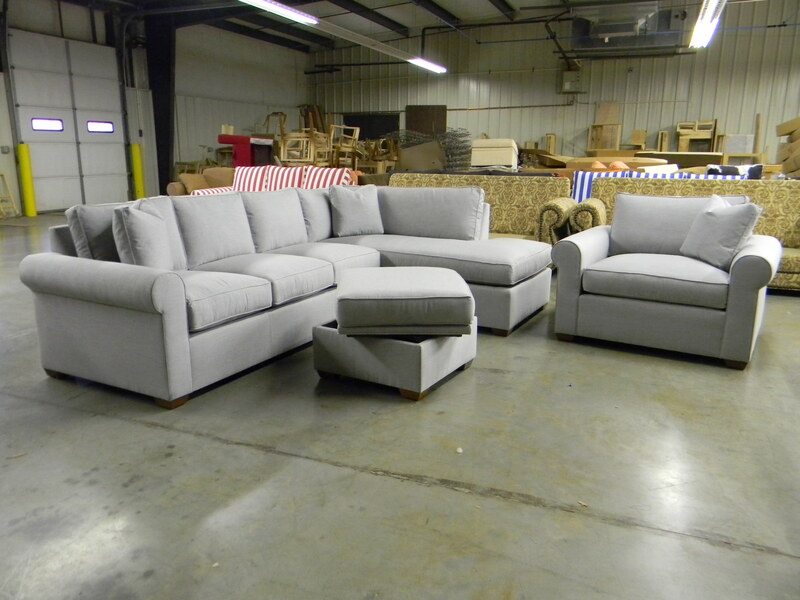 It's so hard to find quality furniture made in the USA these days by people who care. I am very glad that I took that leap of faith. 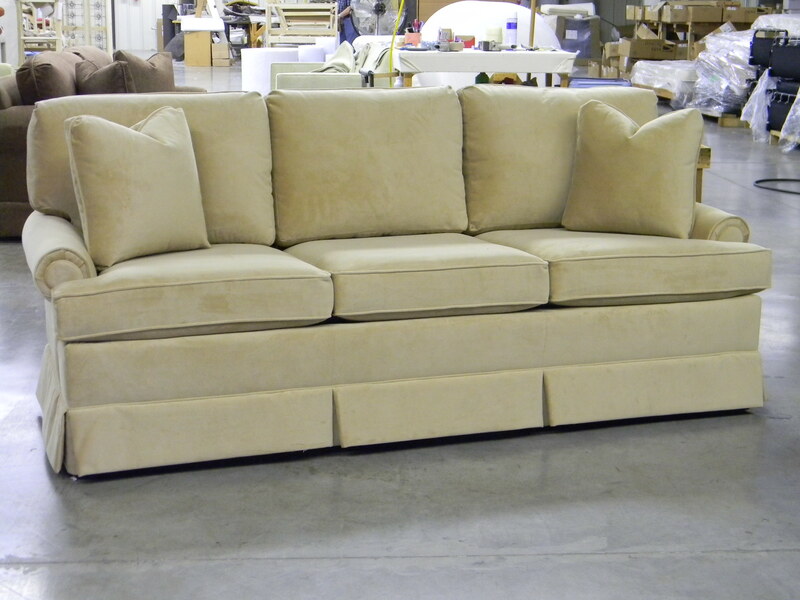 My mother just ordered a couch from Ethan Allen (she is still waiting for hers) about two weeks after I ordered mine. I told her about the ordering process with you guys (this is before I received the couch). After the couch came I sent her a picture and she was very impressed. She finally saw it in real life last week, and she couldn't believe how nice it looked. She fell asleep a couple of times on it, too. Take care and thanks again! 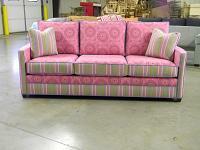 Hi Cathy, I wanted to send a picture of my custom made couch in the space. I had some throw pillows made to complement the couch as well as the color on the walls. 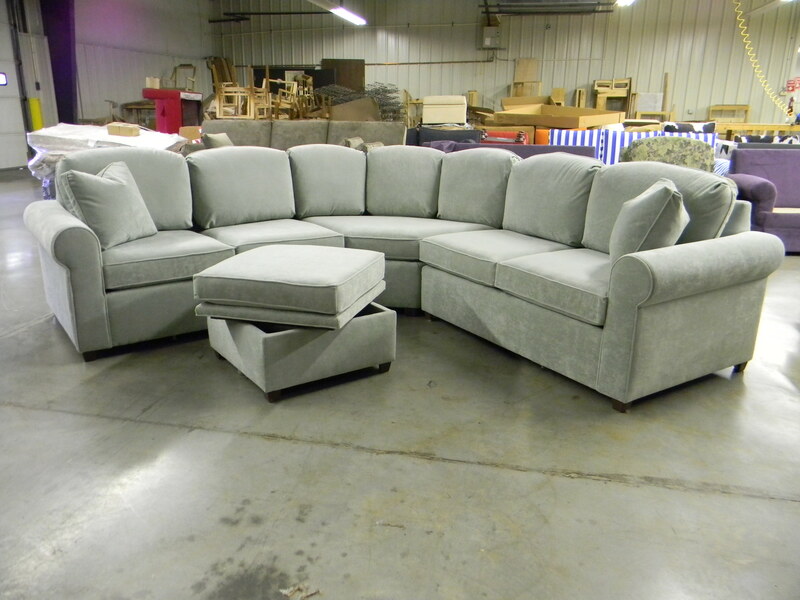 The couch looks better than I could imagine and fits into the space perfectly. Just wanted you to know the furniture arrived and looks really great. It is so comfortable and people who have come in go right ahead and sit down before being offered a seat! Haven't tried the beds yet, but so far we are very pleased. 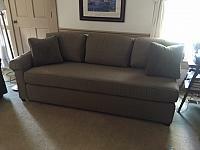 I can't thank you enough for the lovely couch! Also, your efforts to have it here before my daughters visitare most appreciated! Please thank your brother for me. The fabric and color are beautiful too.Many thanks again and I will definitely Spread the good word about Carolina Chair out here in Sonoma! 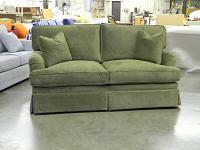 We have admired the quality workmanship in the sofa, too. 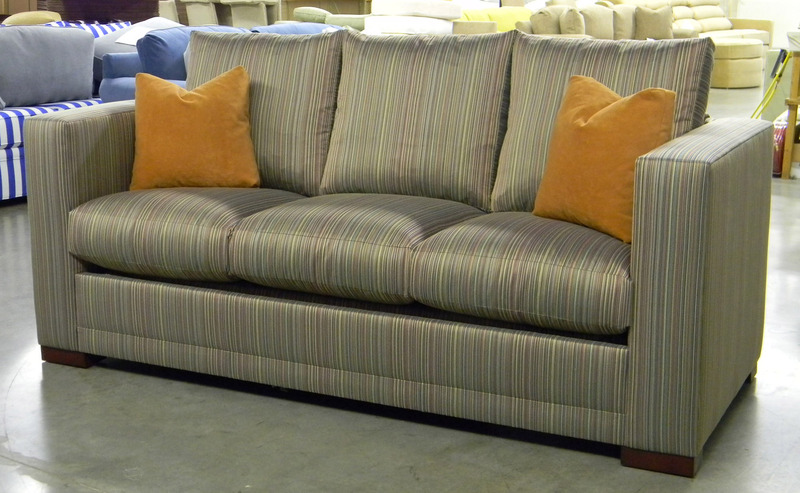 The seams and the pleats are particularly well done, and the frame feels very sturdy. 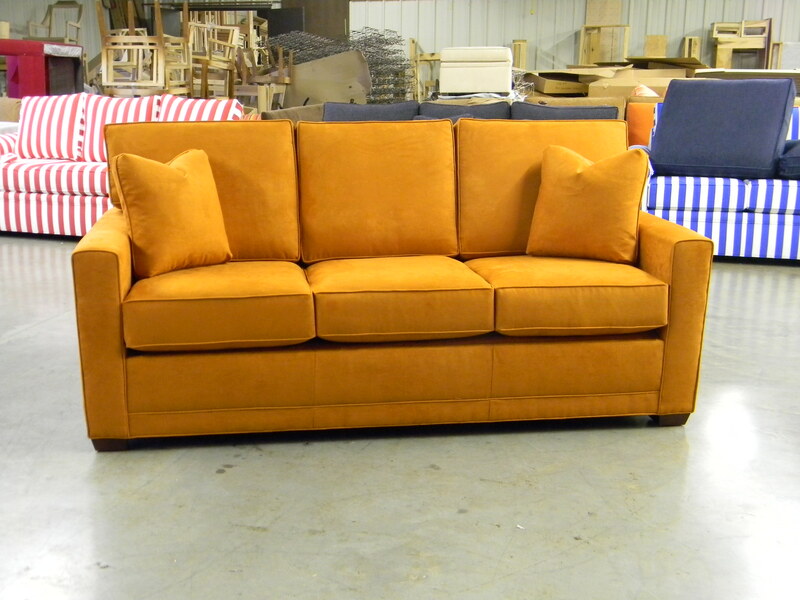 I'm sure we'll enjoy this sofa for many years to come. Kudos to the delivery team from Home Delivery Service, as well. They called several days in advance to schedule the delivery and then Travis called again when they were about 30 minutes away from the house. Both guys were friendly and professional. I'm so glad to have found your company and hope we can give you some more business in the not-too-distant future! The couch is beautiful, looks great in our living room and we are really enjoying it, after several weeks without a couch. 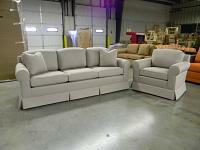 We will certainly tell our friends who are looking for furniture that you do a great job and are a very helpful company to work with. Our chairs were delivered yesterday. 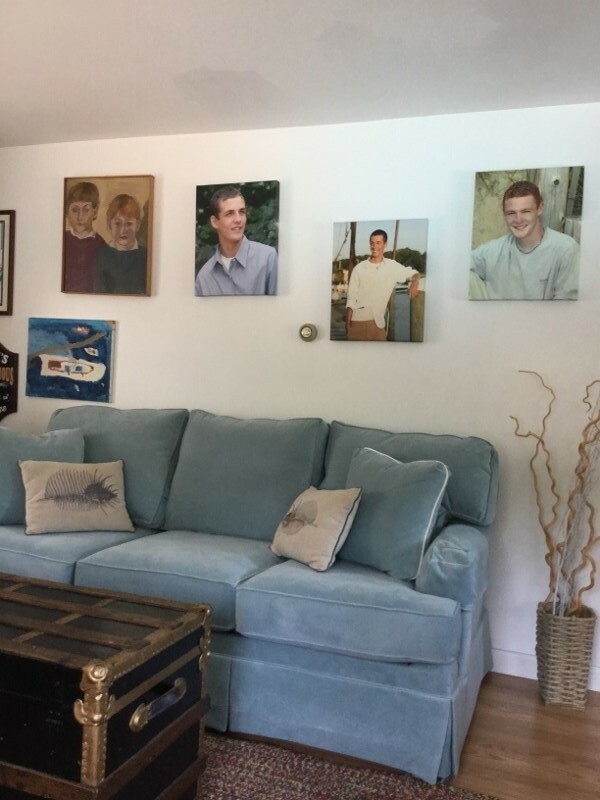 They look great in our living room! Hi Cathy! My sofa arrived on Friday, and it's perfect. All good things are worth the wait! 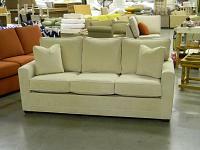 I am enjoying the sectional. It is definitely high quality and looks and feels great. Thanks again and I hope you have a great day! Hope your mother is getting better, too. Cathy! It's just beautiful! More than even I imagined. Cathy!!! I am in heaven!!! This couch is amazing!!! Thank you thank you thank you!!!!!! 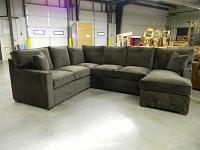 I have been looking for a couch for about 6 years. 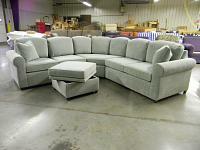 I wanted a sectional. I wanted it to have scattered pillows and a skirt. I wanted the arms to be straight and I wanted it to fit exactly the measurements I needed. Most importantly, I wanted it to be comfortable. 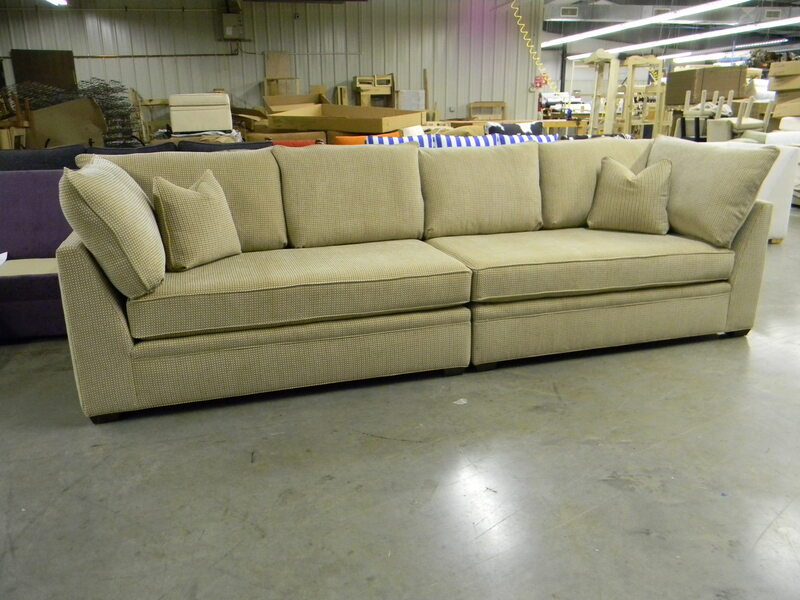 After many years of searching, I realized that I may never find such a couch. Then I happened to find Carolina Chair! You were able to deliver on all of my needs! You know how long it took me to finally place the order. I waffled over the fabrics for months. FINALLY I was ready and WOW!!!! It is beyond my imagination! Simply amazing!!! I can't wait to see it in my den and have my friends over and show it off. Please give a special thanks to your brother!!!! What a craftsman he is!!!! I will for sure spread the word! You all are amazing! 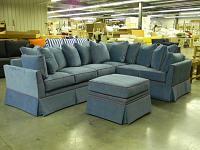 I found Carolina Chair thru an online search for custom made couches. Once I found their site, I just knew this was the company I wanted to do business with. 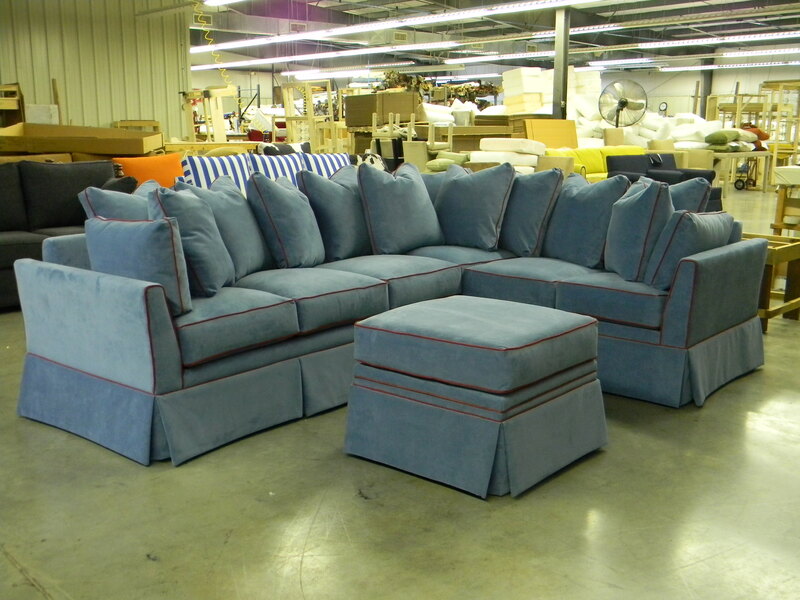 Their history combined with the awesome "made in America" custom couches had me almost sold. But once I spoke with Cathy Fry I knew for sure I had found a company I wanted to do business with! 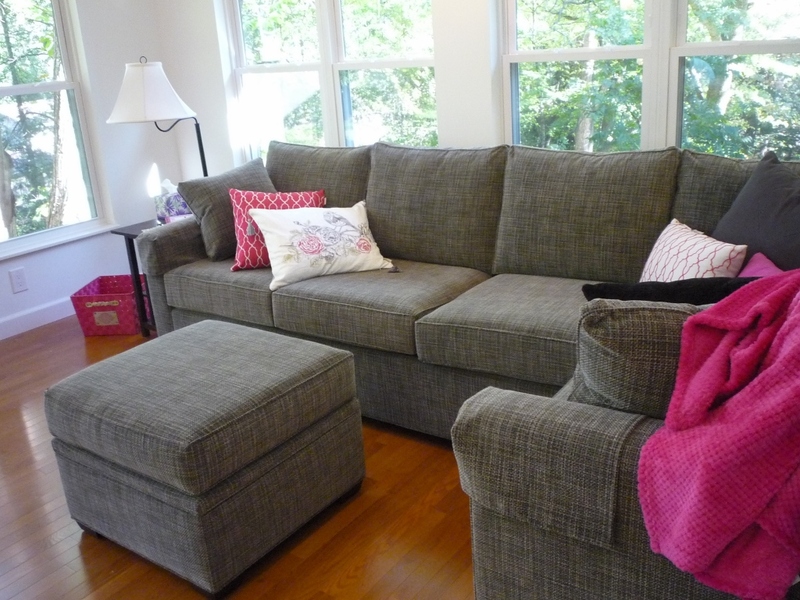 The ability to customize everything from the back height, to the seat length, to the total length, as well as using the fabric of my choice, was just beyond my dreams---and oh boy Cathy is a mind reader because my couches are exactly as I had pictured them in my mind. Not CLOSE but EXACTLY-- that is unbelievable attention to detail during the ordering process and implementation of the actual look by both Cathy,her amazing brother and everyone involved in the manufacturing process!! Follow up, follow thru,timeliness and shipping were all first class. Shipping included and white glove delivery from North Carolina to New York-amazing. I have never seen, anywhere, this quality of workmanship in a final product!! 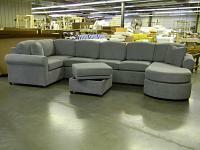 The comfort of these couches is unbelievable! The pricing was great! I am beyond thrilled!! 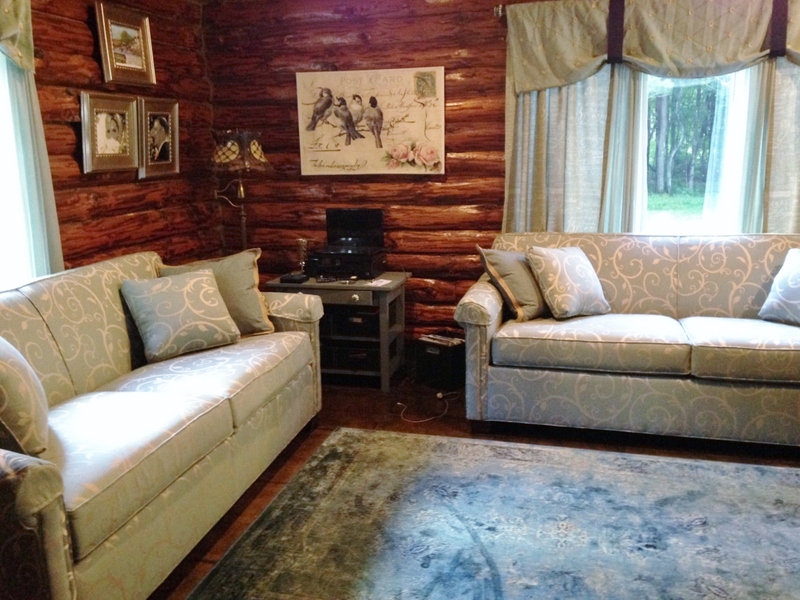 Thank you so very much to the entire Carolina Chair Company, it was such a pleasant experience doing business with you and seeing my beautiful couches in my log home took my breath away! Peruse their web site, look at styles and fabrics and then if you don't find exactly what you want--never fear--Carolina Chair will make your dream furniture a reality!! If you are in the market for new furniture, couches, chairs, stools, pit groups--run don't walk to their web site. 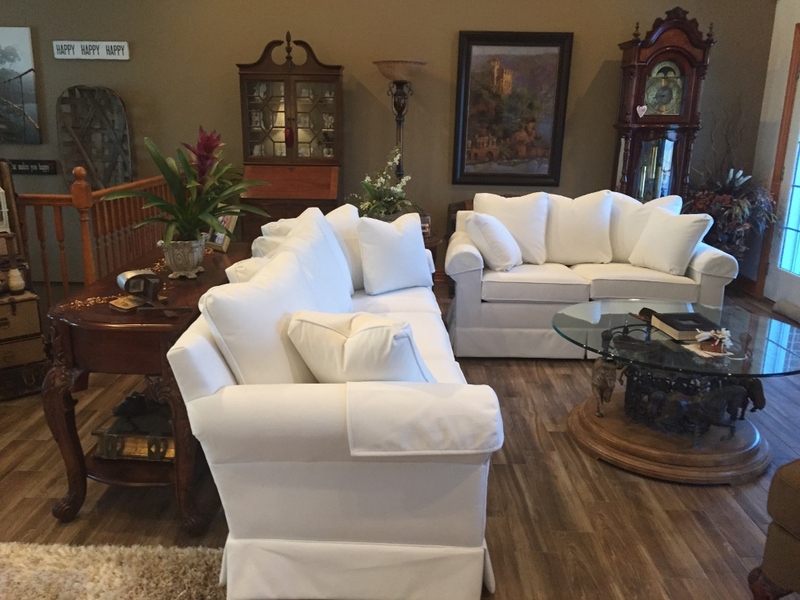 If I could say more to ease any uneasiness anyone may have with ordering "site un-seen" custom furniture from an out of state company, don't worry Cathy will walk you thru the entire process and draw out of you (with a few key questions) what your dream furniture looks like!! And then like magic deliver your dream!! 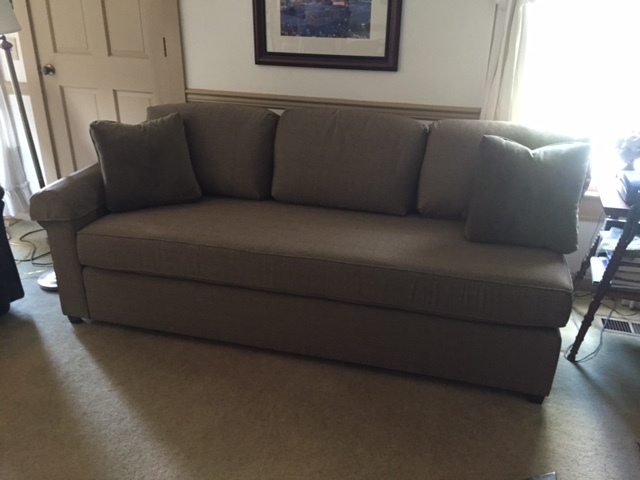 I have been meaning to write and tell you how smoothly everything went with the delivery of our love seat. Because of the frantic last few weeks, I haven't actually seen it yet....although my husband says that it's really handsome! I look forward to seeing it this coming weekend and will write to you afterwards. Your company does business the old-fashioned way, with real support and follow-up. I think that is wonderful. Thank you. 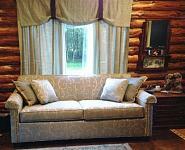 I arrived at our country house on Saturday and found the loveseat in place and looking fantastic. 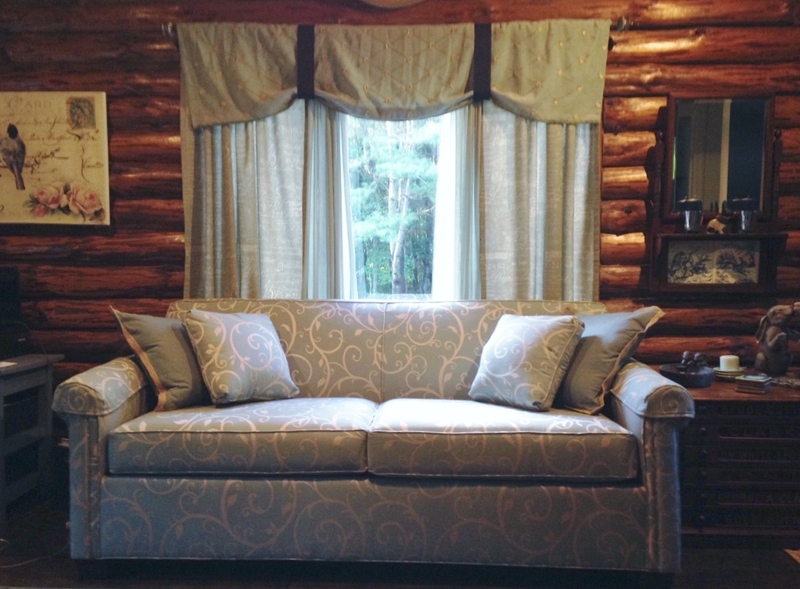 The pillows are just what I wanted--soft but not too soft--and the fabric nice to the touch. We tried out the pump and the air mattress works really well. In short, it's a high-quality piece of furniture, made by what is obviously your high-quality company! I will not hesitate to recommend you. 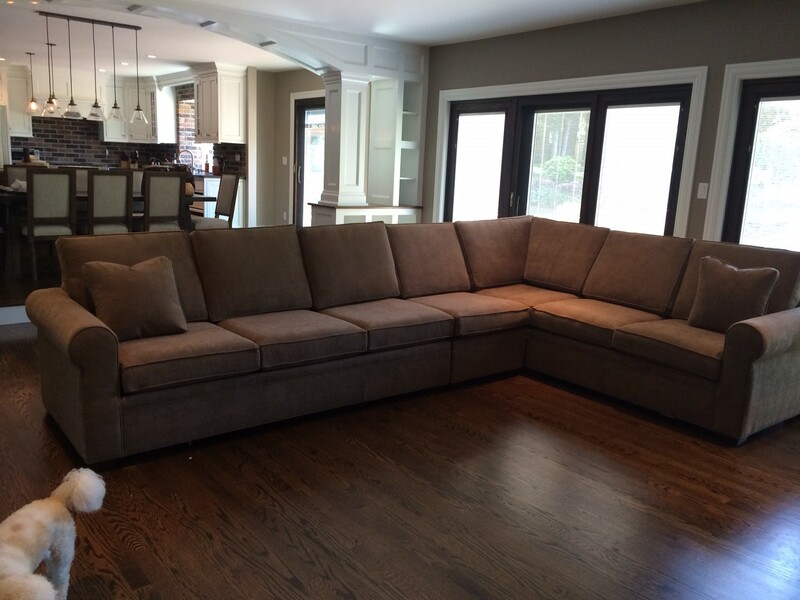 Thank you for all of your help with the sectional, it has worked out perfectly. My couch arrived this morning and I LOVE IT. 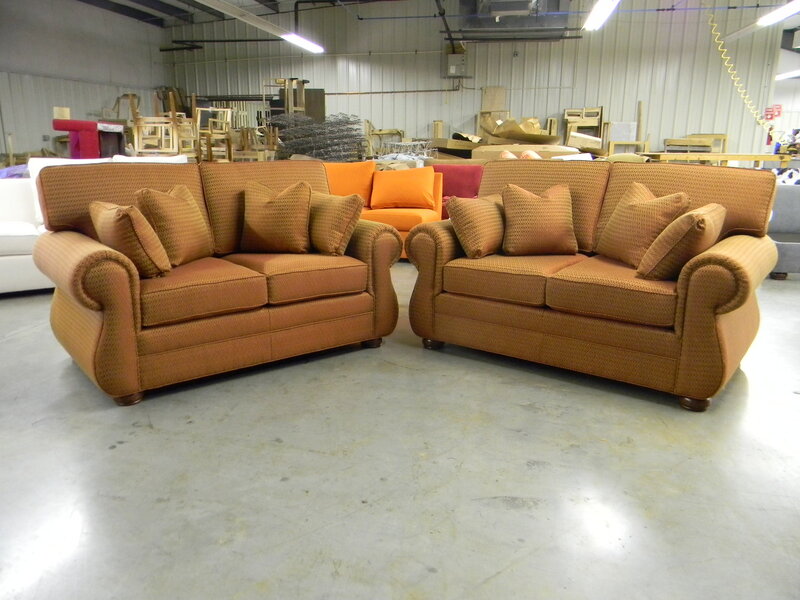 I love the color, the quality, the craftsmanship, and the comfort. I don’t know why anyone would overspend at a big box retailer when they can go straight to you, the manufacturing source. I will be sure to tell all of my friends and family about you and your brothers. You folks did a wonderful job, and I thank you! 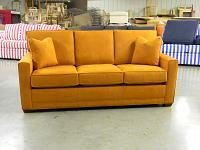 We wanted two identical very long sofas for the long, narrow living area of our contemporary house. The only way we could get the dimensions we were looking for was to combine a left arm only section with a right arm only section, and to do this twice. We did want to ensure that 4 people could or would sit on the sofa at one time, if an occasion such as book club, or a television event/party required it (we host an annual Academy Awards party). 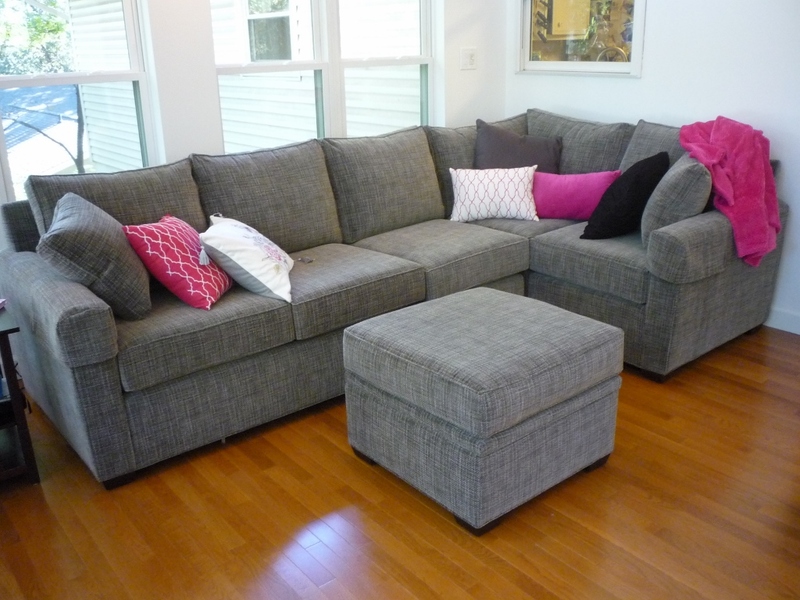 While we love the idea of one cushion across the entire seat of the sofa, but that would have been too long to be practical, so we opted for 4 back cushions over 2 seat cushions. Cathy offered her extensive expertise and extremely valuable advice, as we changed our minds several times until settling on the final design, which looks so great! Thanks for all the hard work. The sofa arrived the other day and we are very happy with the results and will be glad to recommend your company to our friends. Just want to tell you that the furniture came today and everything looks great! And the delivery guys were just wonderful :) Thanks much for everything. 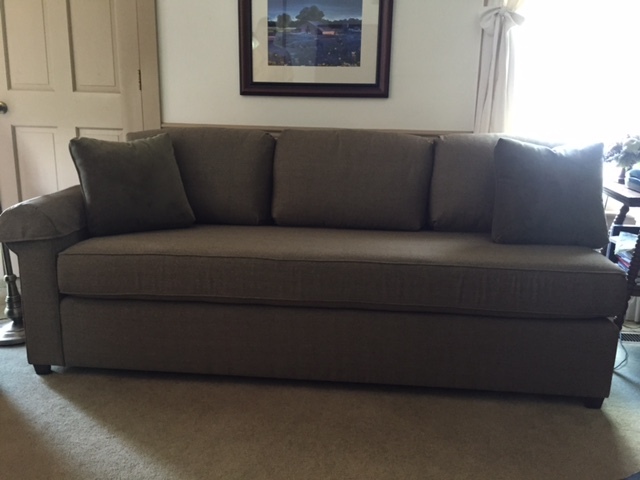 We received our couch this week, and we love it. The delivery company arrived around 5pm, and they were extremely efficient. They had the couch set up within an hour of when they started. We were satisfied with the delivery process. 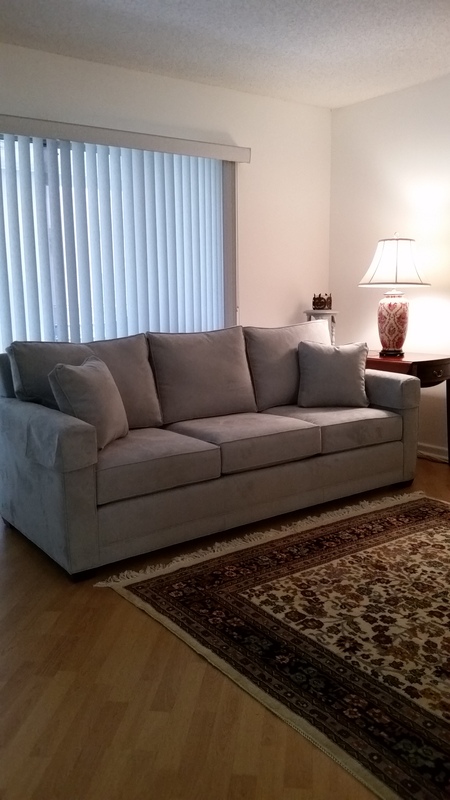 My wife and I more or less stumbled across CarolinaChair Company on line while looking to buy a new arm chair and ottoman and we are so glad we did. 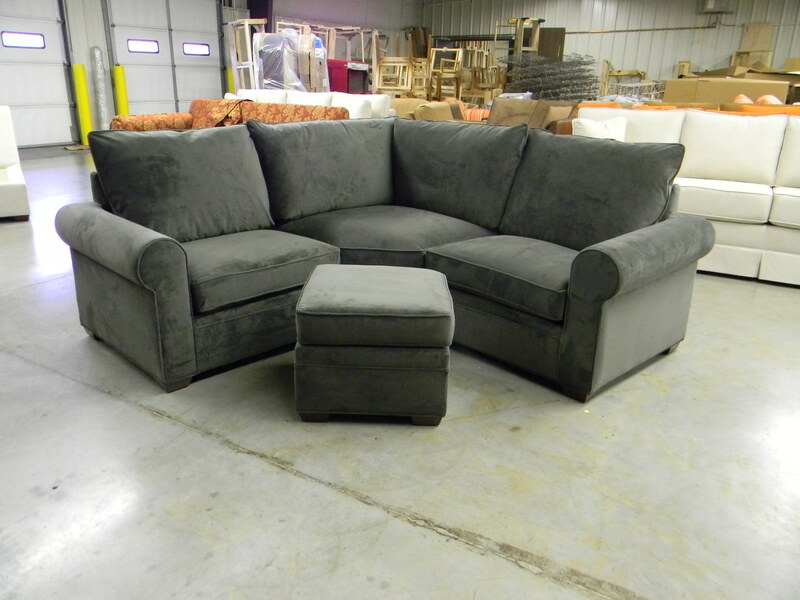 We contacted Cathy who responded within a couple hours saying she would be happy to help us get the chair we were looking for. She guided us through the website, which is pretty easy to follow, showing us various models and fabrics as part of our “tour”. Throughout the process Cathy was extremely helpful and answered all of our questions in a very thorough manner. As we honed in on fabrics, she sent us a number of samples that proved very helpful. We needed to make a few custom changes in the standard design for the chair we selected and Cathy again proved to be of invaluable help. When we finally placed our order we were pleasantly surprised that the price for our “custom” chair and matching ottoman was significantly lower than anything we had seen elsewhere. When our new chair and ottoman arrived, we could not have been more satisfied. Everything was as advertised and the quality was outstanding. We have been enjoying the set for a couple months now and are just as pleased as we were on day one. Outstanding product at a great price! We recommend CarolinaChair and Cathy Fry without reservation to anyone looking for high quality, reasonably priced American made seating. WOW! 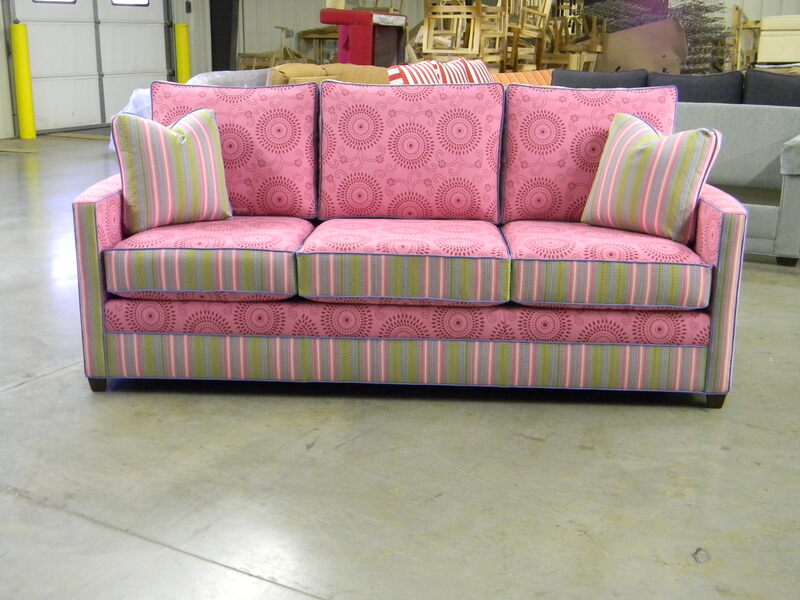 The sofa is awesome....a real one of a kind! I am bursting with delight. You brought my imagination to life. Thank you, thank you so much! I can heartily recommend you with all the confidence in the world! Here is the long-overdue testimonial for your website, with a picture! After more than ten years in a house full of teens, dogs, and cats, the last sectional we bought from your company was ready to move on. 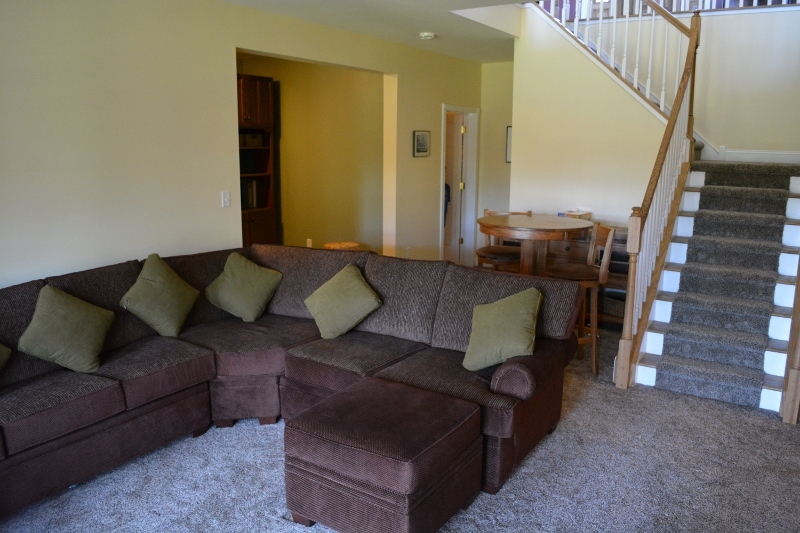 (And it has, in the home of one of the aforementioned teens, who has his own place now with three other young men.) 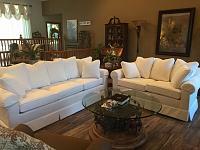 I was ready to think about a couple of smaller pieces for our empty nest, but my husband said, "I want another sectional." So we ordered up the same thing...except with custom modifications to get exactly what we wanted. I knew the back cushions would end up folded in half and jammed against the arms for comfy TV watching, so we got the loose pillow back instead. Legs a little higher, for easy retrieval of dog toys. Casters on the ottoman. Microfiber fabric, for all those spills. We've had a few, and it wipes clean just like the kitchen counter. Amazing. 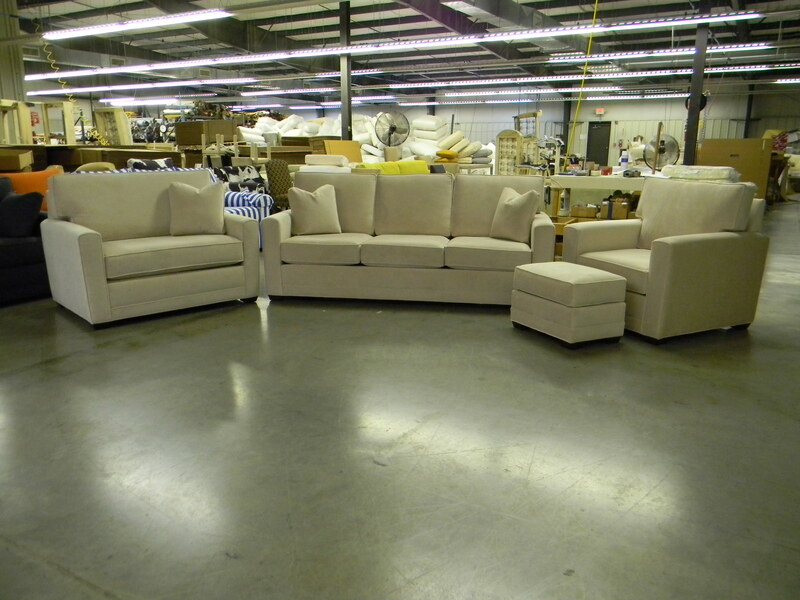 We love our new sectional even more than the old one and are happy to be repeat Carolina Chair customers! 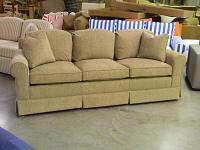 Our friends slept on the sofa for three days and raved about how comfortable it is. Thanks again. 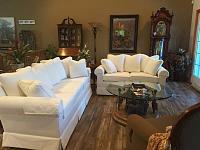 I received the furniture on Tuesday. The 2 fellows were very professional and the shipment came from the longest semi truck I have ever seen. I'm still adjusting to the pieces in my room. 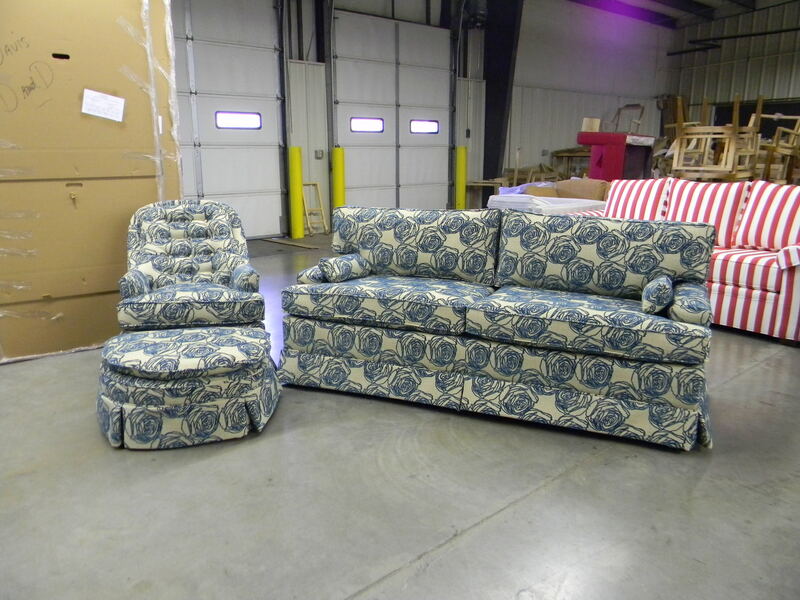 The sample I had of this fabric only showed a section of the flower so until you showed a picture of the sofa, chair and footstool, I had no idea it was a continuous complete flower. I thought the design consisted of partial circular lines in the teal color. I can see where a large fabric sample is what to request. My sample is 5 x 7". The cushions of the new couch are much firmer than my old queen size sofa bed. 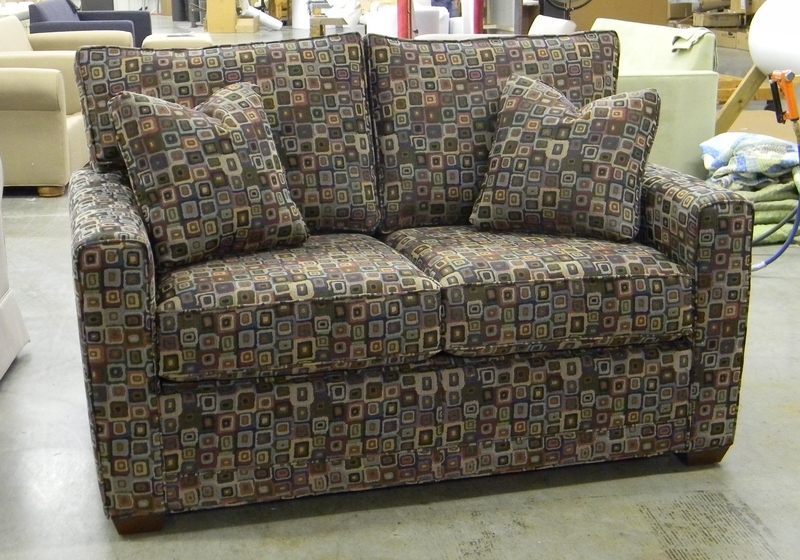 This sofa was made by Mastercraft and was about 17 years old, so I imagine the cushions were rather flattened over the years. 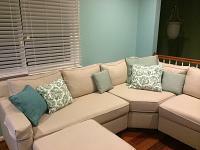 I like the furniture's design and and will gradually adjust to how my room looks now with the new pieces. 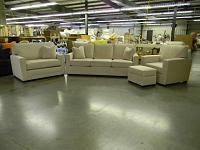 Thank you for all of your assistance and the talent used by your family to produce first class furniture. Nowadays it's rare to see professional products and service. P.S. 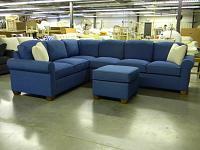 My daughter thought I was crazy going to a North Carolina firm to order my furniture rather than purchase it locally. Believe me it was worth it. Thanks Cathy. We are so very pleased with our new loveseats. By the way, your Hall chaise that we have now is one of the favorite places for everyone because it is so comfortable. This new chaise that we just ordered will act partly as a windowseat for grandchildren. Thanks Cathy. 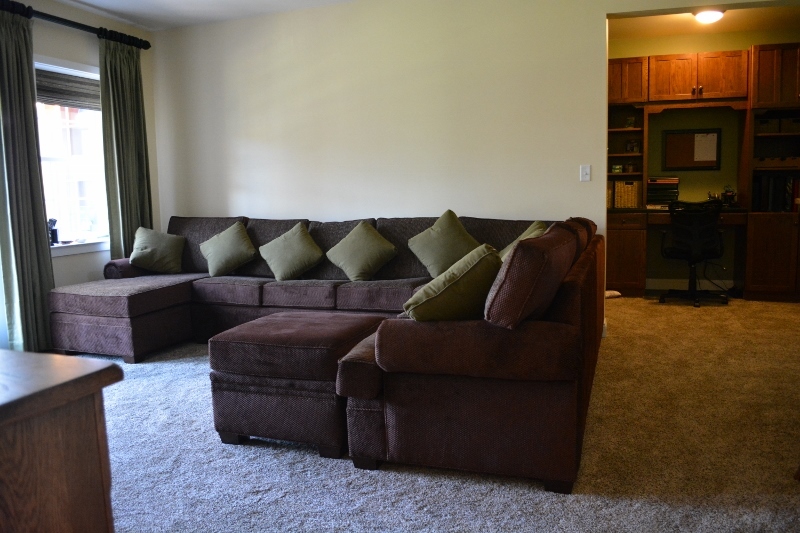 We are pleased with our new loveseats. 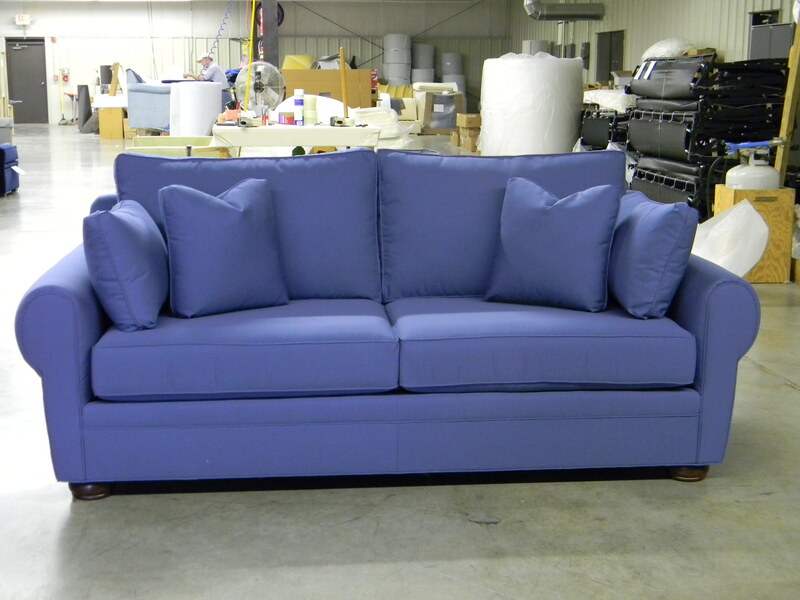 We now want to order a Hughes Queen Sleeper. 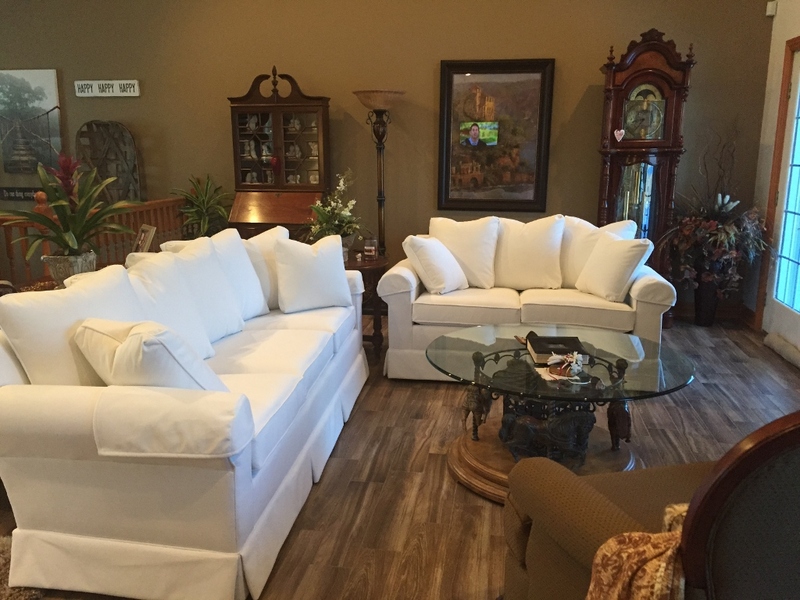 In case you did not get my email from my phone, attached are the pictures of my new sofa and loveseat that look beautiful in my living room. My furniture just arrived and I love it. A white sofa and loveseat delivered in winter and came spotless! They were very well packed and I’ve already bragged to anyone who would listen. I am very proud of the fact that the pieces were made in the USA!!!!! Thanks so very much for the wonderful customer service and a well built product! Sorry it's taken so long to get back to you - we are still busy moving. Sofas were delivered and I could not be more pleased! They are indeed beautiful! I love the Kingsley design. I almost didn't get the curve on the side, but I am so glad I did. 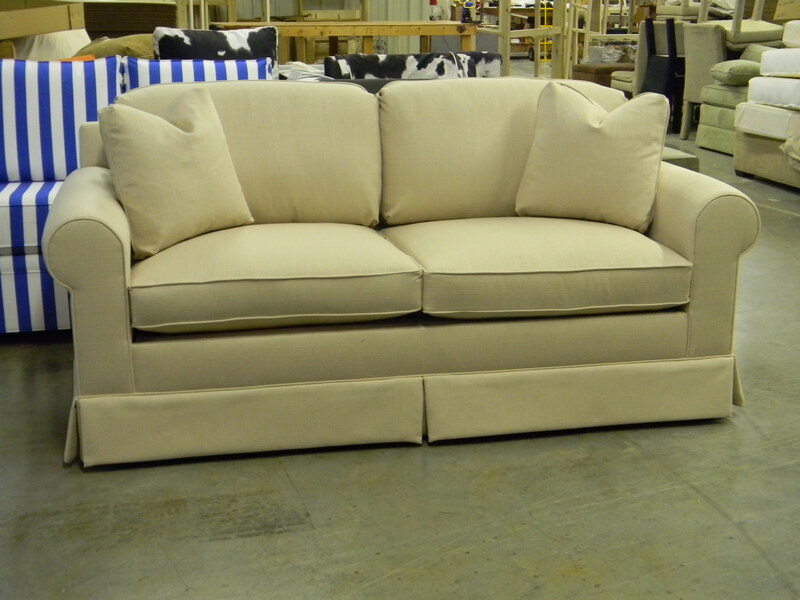 It gives the sofa an elegance that you just don't see anymore. The fabric is gorgeous! They are comfortable too. My whole family loves them! The craftsmanship is truly amazing and I thank you all so much! I look forward to doing business with you again. 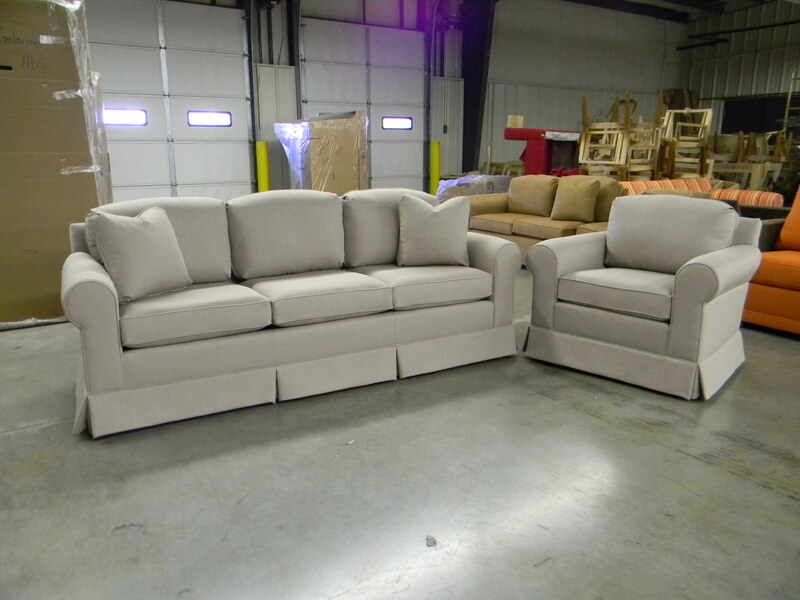 We received our sofa and chair today, and the quality of your product and your service were more than what we expected or accustomed to. We thank you for your first class treatment and are very happy to have found your company that takes pride in the work, product and service. 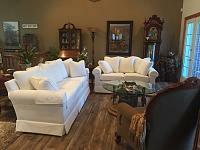 We are now enjoying our fine pieces of furniture and are pleased with your reasonable price. We wanted to avoid the inferior furniture featured in the chain and department stores and to patronize an independent, small family business in our country. We believe in the excellent manner in which your company does business and in your treatment of us as a customer. 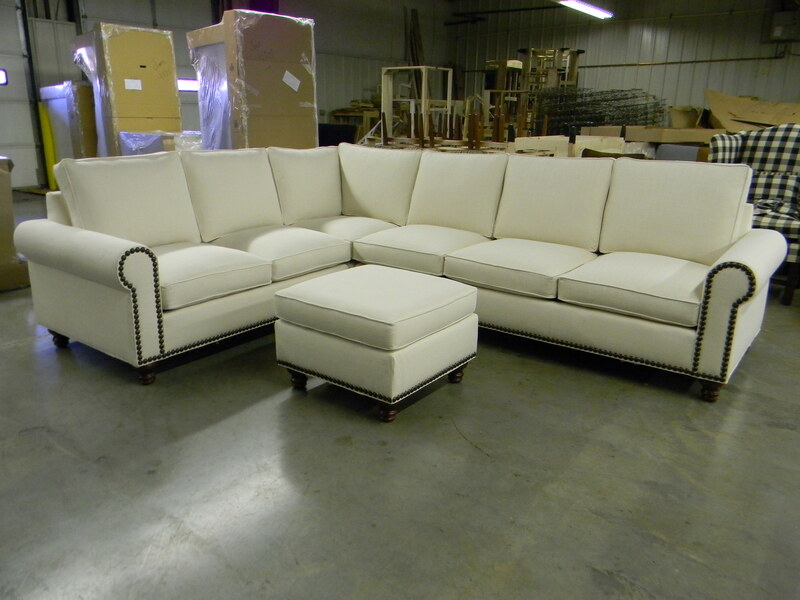 Your business offered us a wonderful, pleasant purchasing experience that has truly earned our patronage. Absolutely love my twin sleeper. It's quality all around and communication with Cathy was was top notch. The delivery process went smoothly. I could have walked in to a big box store but I had much more confidence dealing with CarolinaChair and their family owned business. I was right. The product is quality and I am completely satisfied. I will definitely refer others. The sectional looks great! We loved the first one, and after 10 years of hard wear (two kids, three dogs, two cats and A LOT of entertaining), it is being relegated to the pool house. We are looking forward to another 10 years with the new one. It’s the centerpiece of our home. Thank you! 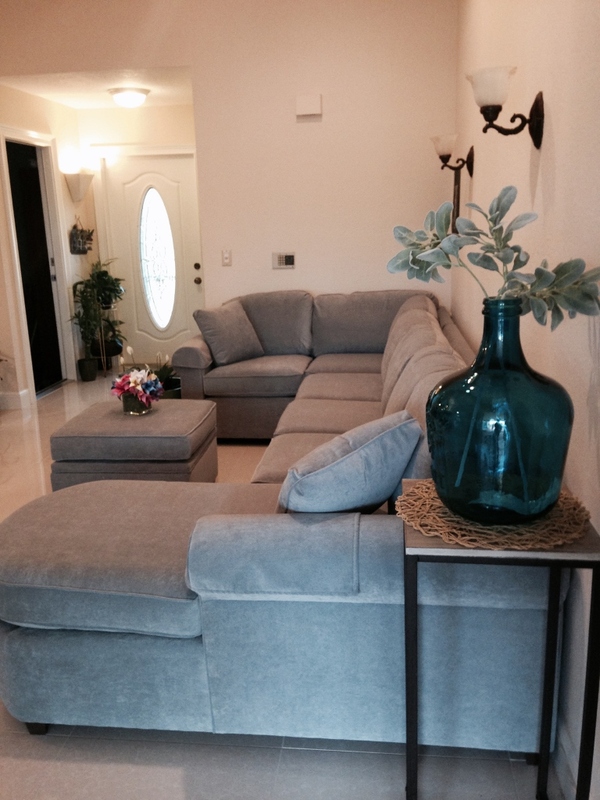 We got the ottoman yesterday and two beautiful pillows! We are enjoying the couch very much. We love the fabric which you recommended. My daughter loves how soft it is and I love that the cats haven’t even attempted to use it as a scratching post!!! Good call on that one! 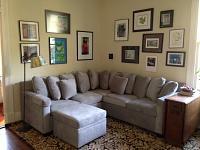 I realized that we had not sent photos of your work in our living/family room when sorting thru old emails - our apologies. You had asked for a few words to explain why we chose CarolinaChair, and as you can see from the attached photos the dimensions were the critical factor in addition to the quality of your work. The arrangement of the furniture was designed to help break up the open plan of the area and we wanted to completely fill the wall without wasted space or an overhang. 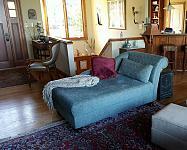 At the same time the depth of the chaise was critical since we had French door that opens on the adjoining wall. We are thrilled with the furniture. In the last 18months it has provided a center for our family to relax and interact. Our interactions with you and your brother were great and we would happily recommend CarolinaChair to anyone we know. Cathy, I just wanted to let you know we received the mattress yesterday as planned. Thank you so much for your help! Thank you so much for everything. You guys are wonderful! Thanks for getting the Air Dream mattress to me so quickly!